This book collects research works that exploit neural networks and machine learning techniques from a multidisciplinary perspective. 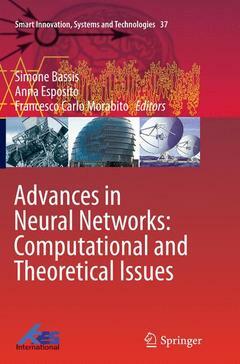 Subjects covered include theoretical, methodological and computational topics which are grouped together into chapters devoted to the discussion of novelties and innovations related to the field of Artificial Neural Networks as well as the use of neural networks for applications, pattern recognition, signal processing, and special topics such as the detection and recognition of multimodal emotional expressions and daily cognitive functions, and bio-inspired memristor-based networks. Providing insights into the latest research interest from a pool of international experts coming from different research fields, the volume becomes valuable to all those with any interest in a holistic approach to implement believable, autonomous, adaptive, and context-aware Information Communication Technologies. Invited Keynote Papers.- Proceedings Papers.